President Pranab Mukherjee today asserted the beauty of the Indian democracy is in the unity of its diversity. When a person looks at the entire stretch of the country with so many ethnic, cultural, religious and linguistic groups, that person gets mesmerised. 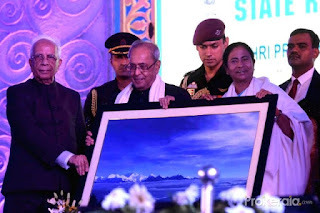 Mukherjee was responding to the state reception hosted by Chief Minister Mamata Banerjee at Chowrasta in Darjeeling this evening. He said despite of so much diversity and vastness in area, no corner of the country remains unrepresented in Parliament. Referring to Darjeeling, the President stressed it is not merely a hill station or a geographical entity, but a mini India. West Bengal Governor Keshari Nath Tripathi described President Mukherjee as one of the most experienced and knowledgeable leaders of the country. He said a number of administrative reforms can be attributed to him such as the RTI, RTE, Food Security and so on. Chief Minister Mamata Banerjee said President Mukherjee recognises the country in its true sense. She said it was due to his vast experience and capability that all political parties joined hands in electing him to the office of the President. Banerjee said Mukherjee has immense love for West Bengal and for the Darjeeling hills. Referring to Darjeeling, the President stressed it is not merely a hill station or a geographical entity, but a mini India. President Pranab Mukherjee today asserted the beauty of the Indian democracy is in the unity of its diversity.